Kid-Friendly Flooring Options - What Works, and What Doesn't? Kids are wonderful, but they can also wreak havoc on your floors. In a home with little ones running around, you need flooring designed to stand up to daily wear and tear and look fantastic doing it. Whether you’re creating a nursery or getting ready for the teenage years, here are some kid-friendly flooring options to consider. There are pros and cons with each type of flooring option. We’ll break down both and help you discover the right flooring for your growing family. Just make sure to read to the end, because we saved the best for last! 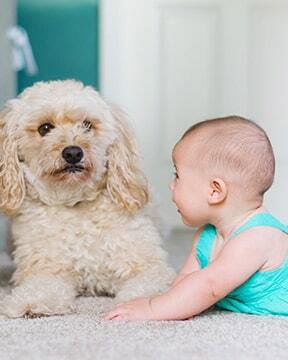 Carpet is soft, cozy, and can protect your little one from scrapes, bumps, and bruises sometimes caused by other flooring options. So, it’s an obvious choice, right? Well, not so fast. Sure, carpet is great for nurseries and helping to protect toddlers or newborns, but it also collects dust and requires constant vacuuming in order to keep your indoor air quality up to snuff. Carpet is also a magnet for stains. 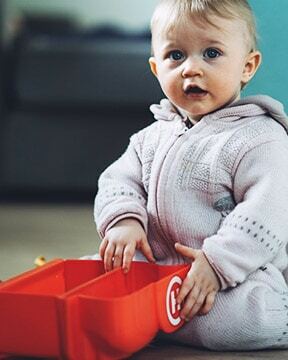 While there are stain-resistant carpets and products like Scotchgard to keep stains at bay, it can seem like a futile task with a toddler running around. Carpet also wears quickly, especially in high-traffic areas. This means it will need to be replaced in 5-10 years, perhaps even earlier. With all that being said, children love carpet and, in spite of the wear factor, the protection it provides may be worth it for your family. It’s not our number one pick, but it’s definitely a kid-friendly flooring option to consider. Hardwood floors look great and never go out of style. They’re also easy to clean and designed to last for decades. That being said, wood floors do suffer wear and tear, and they’re especially vulnerable to abuse from pets and children. Depending on the finish and type of wood you select, it may or may not scratch easily. Some types of wood, like hand-scraped planks, can actually camouflage scratches and dings. If hardwoods do get scratched, they can be refinished to make top layer damage disappear. If you do opt for wood floors, rugs are a must. Not only will they protect your floors, but they’ll protect the kiddos and provide them with a comfortable playing surface as well. Cork is a great option for a kid’s room and other areas of your home. It’s softer than hardwoods and provides a safe, comfortable playing surface. Although cork flooring will work in most areas of your home, it’s highly susceptible to water damage, making it less than ideal for kitchens and baths. This is important to keep in mind, especially if you want a consistent look throughout several areas of your home. If you really want to kid-proof your home, why not choose rubber floors? Seriously, walk into any daycare and the odds are you’ll find yourself stepping on rubber flooring. It may not look the most appealing, but rubber flooring is super strong and able to withstand a variety of conditions. In fact, when properly cared for, it can last for up to 20 years or even longer. Rubber flooring is also easy to clean and care for. It’s quite stain-resistant and can be cleaned with just a mop and some warm water. Plus, it reduces noise and provides extra cushioning to minimise the impact of accidental falls. On the downside, rubber flooring isn’t the most striking from an appearance standpoint. It can also have a noticeable odour, which some kids can find irritating. Want an inexpensive, attractive, stylish, and easy-to-install alternative to the other “kid-friendly” flooring options mentioned above? If so, vinyl flooring is an ideal choice! Vinyl flooring combines most of the positive attributes of the other kid-friendly flooring options and adds a few of its own, making it hard to argue against. It’s scratch-resistant, durable, and easy to clean, making it a great choice for any active home. It also won’t break the bank and can be installed in no time at all. There are also endless color and style options to choose from. Plus, thanks to high-resolution printing and modern manufacturing technology, it’s almost impossible to tell vinyl apart from the real thing. Love the look of Brazilian cherry? Fond of maple or pine? How about slate? Vinyl floors are designed to closely resemble hundreds of different materials! Today’s premium vinyl flooring products are made to stand up to years of abuse and wear and tear. In fact, some products even come with a lifetime residential warranty. Unlike hardwood floors, they don’t splinter or crack. They also don’t require waxing, buffing, and refinishing every few years. In other words, they’ll keep on performing regardless of anything life or your little one can throw at it. Vinyl flooring is also safe, soft, and quiet underfoot. Despite having the look of hard natural materials like stone or wood, it’s comfortable for walking and playing on. It’s also safer. With so many slips or trip and fall accidents happening all of the time, vinyl’s cushioned design can minimise impacts and keep your kiddo out of the emergency room. There’s a lot to love about kids, but cleanliness isn’t one of them. From crayons and crumbs to mud and sand, it seems like they’re always leaving a trail of some kind or another wherever they go. Unfortunately, between extra-curricular activities and today’s busy lifestyles, there’s little time left in the day for cleaning. Vinyl floors solve this dilemma. In addition to being easy to clean, vinyl floors are inherently hygienic. Unlike other materials they’re designed to replicate, they don’t harbour dirt and dust, resulting in less time cleaning and more time enjoying a healthy living environment. Don’t forget about area rugs. While they’re not a legitimate flooring option, they’re a great accompaniment to vinyl floors, tiles, hardwoods, carpet, and any type of flooring you choose. Not only will area rugs provide soft and comfortable spaces for your little one to play, but they’ll help soften the space from a design perspective and help protect your floors as well. As you can see, the options are virtually endless when it comes to kid-friendly flooring. Of course, there are a lot of things to consider before purchasing new floors for your home. However, as long as your kiddo has fun and the floors hold up to daily toy time, it’s a win-win situation for everyone! If you have any questions regarding the right type of flooring for your home and more importantly, your family, our friendly and knowledgeable flooring experts are more than happy to help. 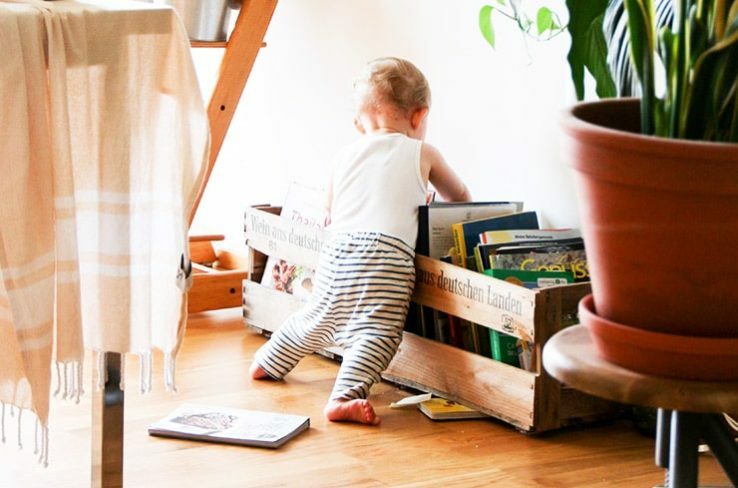 Browse our site to find the perfect kid-friendly flooring for your family today!